Original vintage car advertising poster for The New De Soto Hot as a smoking gun featuring a great design showing an image of a smoking Colt Texan Jr. revolver pistol gun decorated with detailed patterns including leaves and a buffalo on the handle completing the bold red and black coloured slogan Hot as a [smoking gun image] The New De Soto. Founded in 1928, De Soto was an American automobile brand (named after the Spanish explorer Hernando de Soto) manufactured and marketed by the DeSoto Division of the Chrysler Corporation until 1961 when the brand was dropped. Large size. Horizontal. Good condition, folds, light stains, light browning. Good condition, folds, light stains, light browning. 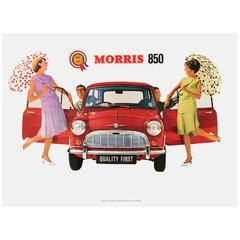 Original Vintage Advertising Poster for the Iconic British Car "Morris 850 Mini"
Original vintage poster, Festival de Jazz, 1988. Artist: Fernand Leger Year: 1949 Dimensions: 78 x 55 cm. Condition: Excellent Format: Linen backed.